Altitude or overlap: The higher the less overlap required, meaning fewer lines in the grid and vice versa. Size: The larger the size the longer the flight track. The app assumes the battery is fully charged at the beginning of the mission. However, it does not take into account the battery that is necessary to reach the first waypoint of the flight and to fly back from the last waypoint. Option A: Plan several missions that do not exceed one battery lifetime (recommended). Option B: Plan one large mission and split it when needed to change the battery. The workflow below describes how to create a project and plan several missions. For more information about the features of the Project List: (Android) How to use the Project List. 1. In the Home screen, tap Project List. 2. In the Project List screen, tap the plus sign at the top right corner to create a new project. 3. Select the new project. 4. 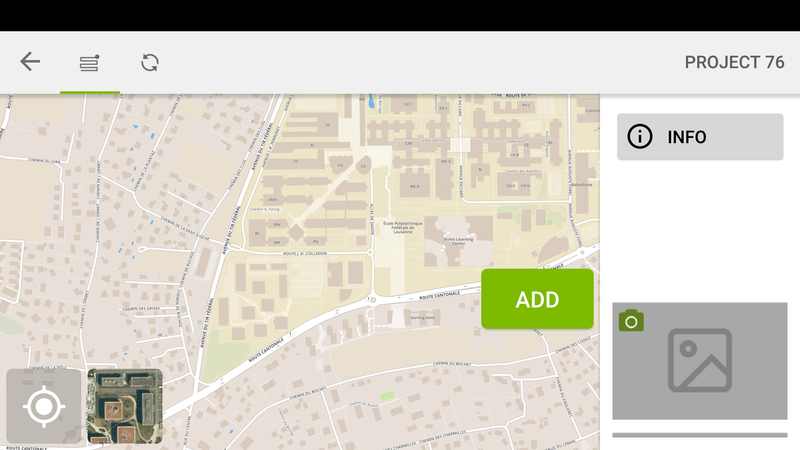 In the Mission view, tap Add to create the first mission. 5. Select the type of mission to add. 6. In the Map view, plan the mission and adjust the flight settings. 7. Tap Save to store the mission in the current project. 8. Repeat steps 5. to 7. above to create and plan other missions to cover the desired area. Note: The Add button creates a copy of the mission being currently selected if the same type of mission is selected. 9. 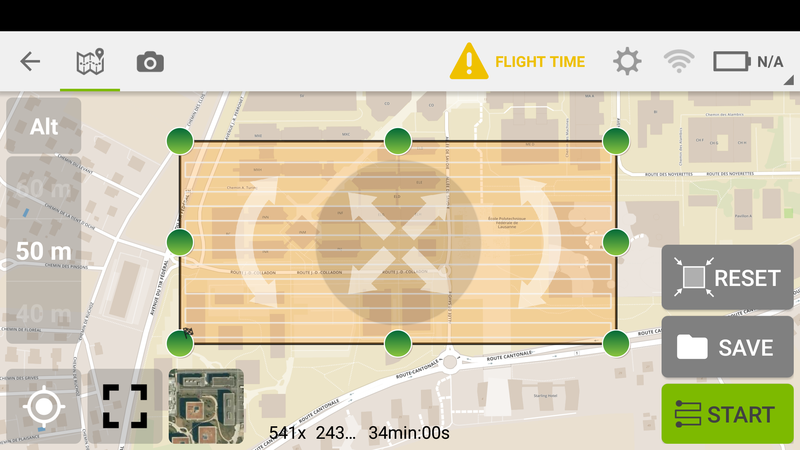 Once the desired area is covered, in the Mission view, select the first mission to fly and tap Open. 10. 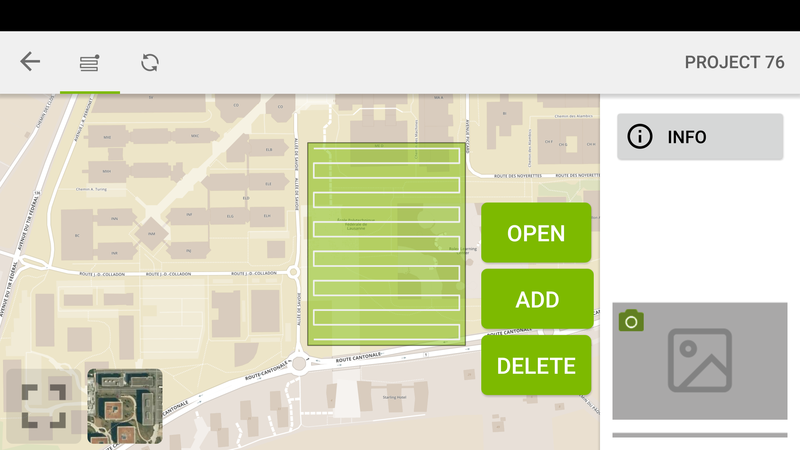 In the Map view, tap Start to start the mission and follow the instructions. For more information: Pix4Dcapture - Getting Started. 11. Repeat steps 9. to 10. to fly the other planned missions and change the battery in between. Important: A significant advantage of this method is the ability to design a large polygonal area by adjusting several small grid missions with each other. When planning the mission, the color of the grid could turn yellow or orange and a Flight Time warning could appear . This means the estimated time to fly the mission is probably not sufficient with one fully charged battery. The workflow below describes how to interrupt a mission that is too large when the drone runs short of battery. The incomplete portion is saved so that it can be flown later e.g. after changing the battery or waiting for flying conditions to change. Warning: This is different from multi-battery flights because it requires user intervention. 1. In the Home screen, select the type of mission to fly. 2. 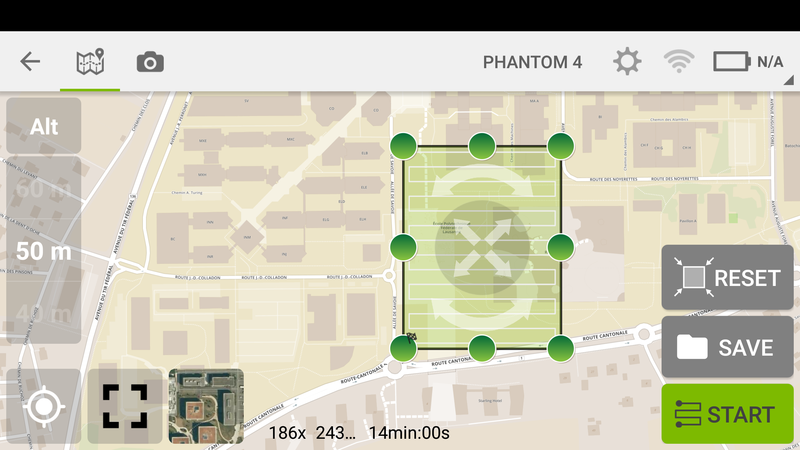 In the Map view, plan the mission and adjust the flight settings. Important: Safety restrictions like the flight time warning can be bypassed if the user advanced mode is activated. In the Home screen, tap Settings, scroll down until the section Advanced and check the box Enable advanced mode. 3. Tap Start to start the mission and follow the instructions. 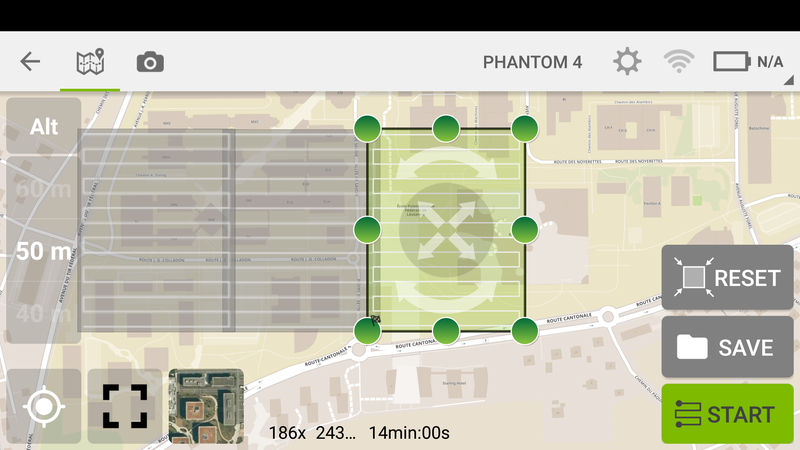 For more information: Pix4Dcapture - Getting Started. 4. When the drone is running short of battery, tap Abort or take over manual control to interrupt the mission. 5. A new grid is automatically created with the remaining lines. 6. Wait for the drone to return to the homepoint and change the battery. 7. Tap Save to store the remaining lines as a new mission. 8. When ready, tap Start to resume the initial mission and fly the second mission. 9. Repeat steps 4. to 7. if needed to split the large grid into more than two grids. For more information about the resume option: (Android, iOS) Multi-battery flights. How much do the individual grid missions have to overlap? Do the planned surfaces have to intersect each other? or can I lined them up without them touching each other? I would like to record a very large area with a High Quality. Thank you for your question. In a general way, we always recommend being sure that the overlap between the two missions will be enough. Then I would recommend you partially superpose the grid taking a safety margin to be sure that the reconstruction will be good in those particular areas where it is at the junction in between two missions.